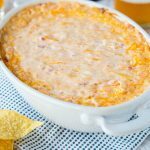 Green Chili Chicken Enchilada Dip – Bubbling hot gooey, cheesy enchilada dip. 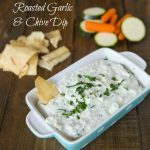 Turn your favorite green chili chicken enchiladas into a dip perfect for game day. Are you a football fan? I am all about watching football if a team I care about is in the game. But I don’t really want to watch just to watch. So in that case, it is time to focus on the food! Good snacks are always required when watching football or any sports. 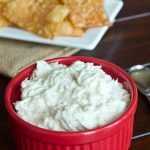 A cheese dip like this beer cheese dip is always a hit at parties. But sometimes you want something that you can make ahead of time. Plus, it is nice when it can be a little hearty. 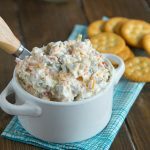 Like Barbecue Chicken Dip – loaded with chicken so you can almost make a meal out of it. I love just about anything when it has green chili in the name. Salsa verde isn’t quite the same thing, but I still love it. Instant Pot Salsa Verde Chicken is one of my favorite last minute dinners to make. So much flavor and so good! If you love anything with green chile also, these Smothered Burritos have your name all over them! Adding a can of green chiles can add a whole other dimension to your dinner. Salsa Verde Chicken Skillet is another example! 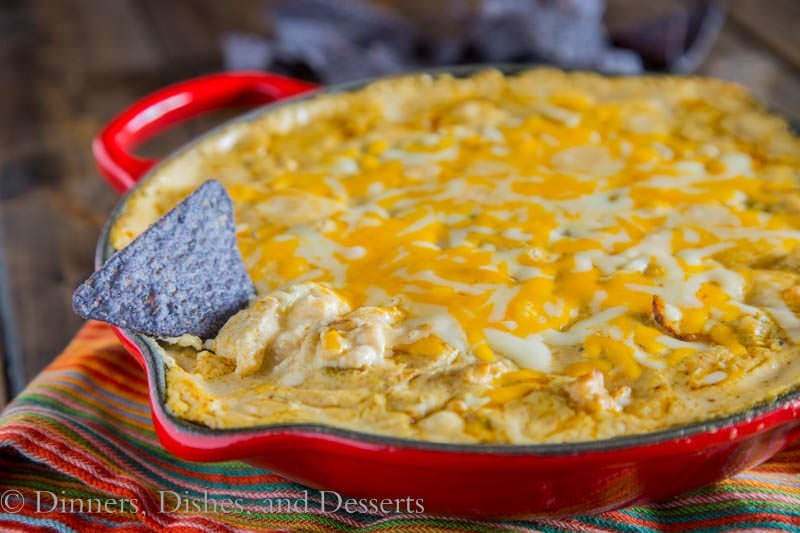 This chicken enchilada dip is a favorite, and disappears at any party I bring it to. 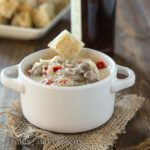 You can check out this Beef Enchilada Dip too, if you want another fun version. 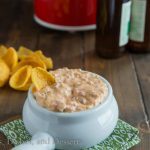 Or try the classic Buffalo Chicken Dip at your next party if you want to win everyone over! 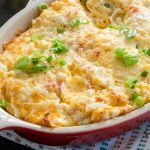 If you are looking to up your game, from the average cheese dip, and impress your guests this chicken enchilada dip is it! 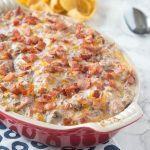 I have to say I am eyeing this Loaded Baked Potato Dip for my next get together. 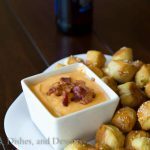 So many great Super Bowl food ideas! Not really sure how to narrow it down. 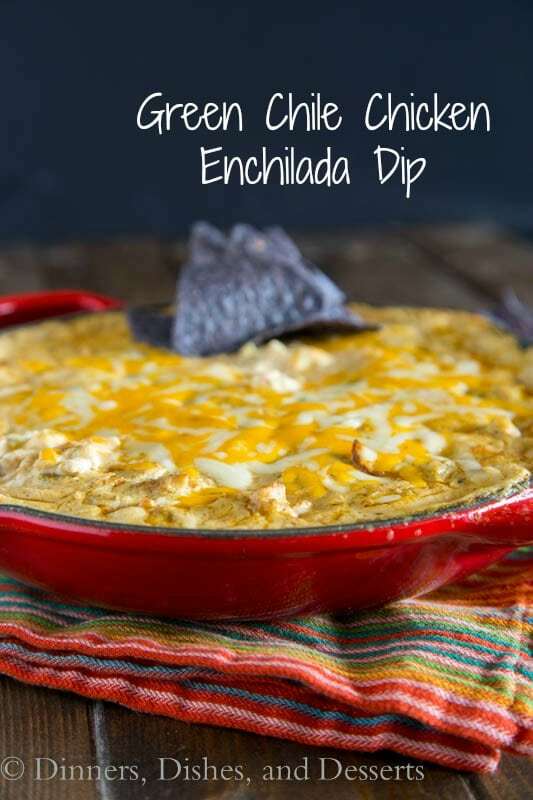 This chicken enchilada dip is super easy to make, you can do all of the work ahead of time. Then just bake when you are ready to serve. You could even put it in the crock pot to keep it warm. 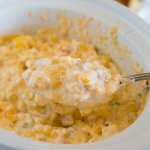 Crock pot dips are the best when entertaining or going to parties. You don’t have to babysit or worry about it, it just stays warm and delicious while you chat with friends. 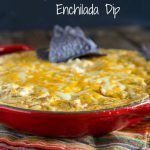 Green Chili Enchilada Dip is another version that leaves the chicken out, if you want something a little less heavy. But if you add the chicken, you can probably consider it dinner, so you pick! 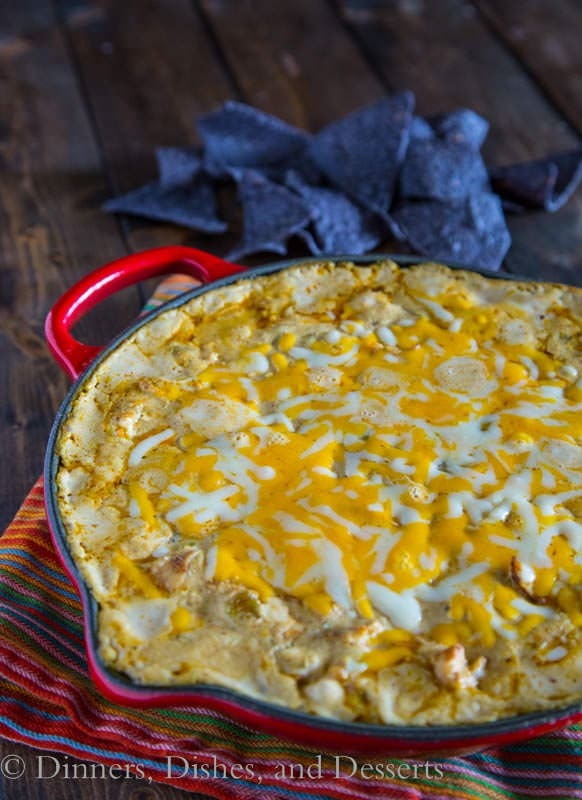 Green Chili Chicken Enchilada Dip - Bubbling hot gooey, cheesy enchilada dip. 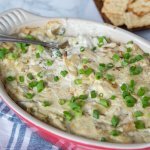 Turn your favorite green chile chicken enchiladas into a dip perfect for game day. In a large bowl mix together cream cheese, sour cream, enchilada sauce, green chiles, cumin, chili powder and salt until well combined. Add in chicken, Mozzarella cheese and 1/2 cup Monterey Jack cheese. Pour into an oven safe skillet or baking dish. Bake for 20-30 minutes until bubbly and hot. Top with 1/2 cup Monterey Jack cheese. Return tot he oven until melted. Mix all of the ingredients together. Place in a slow cooker for 3-4 hours on low until hot. Serve with tortilla chips. Nutrition information is an estimate and varies depending on the brands and products you use. Stomach bugs are the worst! I’m glad he’s feeling better. This looks awesome! I love anything with green enchilada sauce! I love Mexican food, and this looks great! It would be perfect at a football party. Can’t wait to try it. Oh I am allll over this, and my family would die of happiness if I made this for the superbowl! 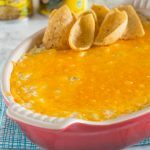 I am totally enamored of any and all warm, cheese filled dips, but especially the ones that are based on Mexican food! Yum! I pinned this and can’t wait to try it! Yummy!! This is my kind of dip!! Thanks for this delicious post. This was the perfect treat to take to our New Year’s Eve party. Using the leftovers today as the filling for Chicken Rollups from http://www.plainchicken.com/2009/08/chicken-rollups-2.html. This looks so good! I love green chilis and cheese:) I am putting this on my menu for next week! Oh this is awesome! football season is around the corner and I will be making this one! Very yummy! Because I was short on time, I doubled it and just mixed it all together, no cheese on top. It was a hit. Anyone try turning these into enchiladas?